Between 1970 and about 1990, I was a dedicated collector of fine, wood-stocked hunting rifles. I didn’t have a lot of them, but what I did have was choice, and among the very best were four that were made by a North Carolina artist (now retired) named Joe Balickie. Joe was so thin that when he took a shower he had to hold a coat hanger in his teeth to keep from going down the drain, and his rifles were equally skinny—not an extra ounce of walnut or steel anywhere. He always came up with spectacular wood, and his work was always original—no two Balickie rifles looked alike. But in 1978 I bought my first synthetic-stocked rifle and gradually acquired more plastic as the wood-stocked guns went on down the road. But I always wondered what it would be like should I see one again. This past weekend at the East Coast Fine Arms Show in Old Greenwich, CT, I found out. I was running a rheumy eye down a rack of rifles being offered by Amoskeag Auctions, when I spotted a dark-honey-blond stock that could have only belonged to a .270 Joe Balickie built for me in 1985 or so. And so it was. The rifle was absolutely mint. I had never shot it, and whoever owned it after me had kept its closet-queen status intact. Once more I took in the wonder of century-old Turkish walnut, the perfection of Joe’s checkering, and silvery black of real rust bluing. I asked the guy from Amoskeag if I could buy the rifle for $73 and a laundry ticket, which is what I had in my wallet. He said sorry, no, and then quoted a price that was about what I paid Joe 20-odd years ago (left-hand rifles are hard to move, it seems). I thanked him, walked calmly out to the parking lot, and when I was sure no one was looking, bit a piece out of the whale tail of a Porsche Turbo. I’ve written before that the only ballistic information you can believe is what comes out of your barrel and hits your targets. This was driven home yet again last week when I ran some drop tests on my beloved 6.5x55 New Ultra Light Arms rifle. 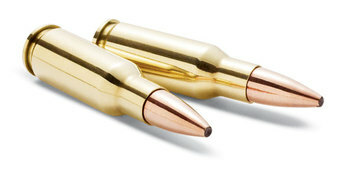 I use two loads in it: the first is Norma factory rounds firing 156-grain Oryx bullets at 2,508 fps; the second is a handload that shoots the sensuous, attractive 130-grain Swift Scirocco at 2,750. I sight in the Oryx loads (of which I am fond because they don’t punch dinner-plate-sized holes through 90-pound deer) to hit 1.5 inches high at 100 yards; this is fine for 90 percent of the shots you get at whitetails. The Swifts print 3 inches high, and if I think I may get a long shot I use those. However, until last week I was relying on guesswork to figure how much the two slugs actually dropped, so I went to the range and found out. The Scirocco was no surprise; it dropped 7 inches below the point of aim at 300 yards. The surprise was the Oryx. I first tried it at 200 yards, and it dropped only 2 inches below the point of aim which is odd because it has a low ballistic coeficcient, not much velocity, and is zeroed pretty low. “What ho,” thinks I, “maybe I can use this sumbitch at 300 yards,” so I tried it, and it fell off the paper. Going by the holes in the backstop, the Oryxes dropped 17 inches from the point of aim, which means it is a dandy 200-yard bullet, but no farther. So now I know, rather than assume, and there is a world of difference between the two. Savage Arms, which gave the shooting industry the leaping fantods when it introduced the Accu-Trigger, has just announced the Accu-Stock, which is just as radical. In stocks, as in other areas, the more rigid the better, and there are a couple of ways to achieve this. The first is used by High Tech, McMillan, and New Ultra Light Arms, who employ Kevlar and graphite, or reinforced fiberglass, to create a stiff stock. The materials themselves, when fused together, are more rigid than a rifle barrel, but such stocks are made largely by hand and are expensive. The second approach is to use something limper, like polymer (which can be made fast and cheap) and strengthen the stock with an aluminum spine. The Accu-Stock is polymer, reinforced with an aluminum spine that runs from the action all the way down for fore-end. But there is more: Savage employs a wedge bolt to push the recoil lug back into the aluminum spine. This is not a new idea; Ruger has been doing it for decades but with a bedding screw that pulls down and back at a 45-degree angle. In addition, the Accu-Stock’s bedding cradle squeezes the action from all sides, fusing (or so claims Savage) the action and stock into one unit. This runs counter to conventional stock-making wisdom which holds that all the pressure on an action should be downward, and that the only hard contact between action and stock should be on the rear face of the recoil lug and (optionally) at the tang. During the late 70s and early 80s, when synthetic stocks were just starting to be accepted, it was common to epoxy the entire action in place. I had three rifles that were so stocked and invariably broke the action free so I could get at the triggers. None of them shot one iota differently when they were held together only by the bedding screws. But we shall see. The Savage Accu-Trigger has had a major effect on rifle design over the past decade, and Savage may be right about its new stock, too. 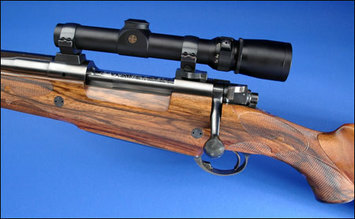 I now write regularly about big-game rifles that break the minute-of-angle mark, and I’m still uneasy about doing it because for a very long time such guns did not exist at any price. You could shoot for years without seeing that kind of accuracy. In 1985, I was hunting in South Carolina with the great knifemaker and die-hard Secessionist George Herron, who told me about a gunsmith named Kenny Jarrett, down the road in Jackson, who was building sub-moa big-game rifles. Yeah, sure, I said, so George went into his shop and brought out six benchrest targets and a stubby 7mm/08 Improved that Jarrett had built on a Remington 700 action. Each of the six groups could be covered handily by a nickel. I was like to swoon, and had to grab a nearby canebrake rattlesnake for support. And down the road I went to to meet Kenny. Kenny Jarrett was a farmer (and still is) with no formal mechanical training who became interested in benchrest shooting in the 1970s. Being mechanically aptituded, it seemed logical that he should build his own guns, and so he did just that, and began winning. He was also a whitetail hunter who often shot at long distances across beanfields, and it seemed to him that if you could build a big-game rifle that shot to benchrest standards it would make the deer sweat. And so he did. His first big-game rifles were crudely finished and heavy, but he got them to the point where they would shoot a half-minute of angle or better. At the time, this was unheard-of, but word got around, and so did the rifles, and eventually Jarrett found himself in the gun business. Over the years he has gone from a shade-tree gunsmith who built rifles out of other peoples’ components to the head of a small factory that makes barrels and actions and assembles, finishes, breaks in, and develops loads for, completed rifles. (Jarrett’s Kevlar and fiberglass stocks are made by a separate contractor to his design and specs. He gets his triggers from Jewell and his scope bases and mounts from Talley.) It employs 11 people, and smacks as much of aerospace as of gunsmith. He is the only gunmaker I know of who has an EDM machine—and an employee whose sole job is to keep the EDM happy. A number of years ago he developed his own bolt-action, a three-lug design which he calls the Tri-Lock, and since then his rifles have taken on a distinctive look of their own. There are six different models, but the representative one is the Ridge Walker, a gun that typically weighs 8 ½-pounds with scope, has a 25-inch #3 taper barrel, and almost invariably comes with a muzzle brake of Jarrett’s own design. He has his own line of proprietary cartridges, the most popular of which (in a walk) is the .300 Jarrett, a fire-breathing .30 magnum based on the 8mm Remington magnum. Jarrett loads it with 150-grain (at 3,500 fps) to 200-grain (3,000 fps-plus) bullets. Every rifle is broken in and has a handload (or loads) developed for it, and no rifle leaves Jackson with fewer than 150 test rounds through it. They are very expensive guns, but from what I’ve seen they will outshoot anything else you can buy, when used with their tailored ammo. In .30-caliber and under, they will shoot a half-minute or less, and I’ve seen .300 Jarrett test targets—lots of them—that went under .200. There are plenty of factory rifles that will shoot MOA, and a great many custom guns will do much better than that, but I don’t know of anything else that will shoot to this standard. But the Wealthy Hunter (hereinafter known as WH) was like many other men who had done well in life. Because he knew from phrenology, and making money, he thought he knew about guns and hunting as well, and would not listen to the WCGB who had been accumulating knowledge for 40 years but who, after all, had to make a dollar now and then. They compromised on a 26-inch barrel. The WH took delivery of the rifle, worked up a handload employing 140-grain Nosler Ballistic Tips at nearly 3,600 fps that went into one ragged hole, and went off to practice. The WCGB sighed and went back to his lathe; he had heard it all before. And so a month passed. Then the phone rang in the WCGB’s shop. It was the WH, back from the West. “*&^*(*&*&&&#@^[email protected]#$,” said the WH. This is a true story; only the names have been changed to protect the silly. I would point out what the morals are, but you can deduce them yourself. Unless, of course, you’ve made a lot of money at something and don’t need any kind of advice from anyone.